At the 2008 UOI conference, I presented a paper on Symbian’s ecosystem management efforts and what it told us about the problem of firms using value networks for their open innovation strategies. Of course, it draws on the discussion of value networks in the final section of the 2006 book — the section that was (under our decentralized production process) was shepherded by Wim Vanhaverbeke. I haven’t circulated the paper, but have engineering students using it as a conceptual basis for their study of the Android and iPhone application stores. I also have been using an abridged version as a rough case with my MBA students to make the point about ecosystem management. I’d be glad to share the case and notes if anyone’s interested. The paper itself is sitting on my desk awaiting revision, but given the interest it’s sparked locally I thought I’d share it more widely. Since there’s recently a raft of new open innovation research published, it also needs updating to reflect the state of the art. Suggestions are welcome. My friend David Wood (the only executive at Symbian from beginning to end) has been blogging (and tweeting) all week at the FT Innovation 2009 conference. One of the guest speakers was Henry Chesbrough, speaking on the topic “Open Innovation: Can it save the world?” Not surprisingly, the first half of the talk was about open innovation and the second half about applying the principles of OI to green technologies. In his blog article, David reports on both halves. The first half makes a nice summary of the whole open innovation thesis, as presented in the original 2003 Open Innovation book. The second half offers suggestions of how open innovation is being used to accelerate progress in green technologies, such as the GreenXchange project hosted by Science Commons (with funding from Nike and BestBuy). The model seems to fit what Scott Gallagher & I (in our 2006 article) call “pooled R&D” in the context of Eclipse and other firm-sponsored open source projects. However, one could also argue that it’s an example of cumulative innovation — today a somewhat diffuse and ill-defined literature — particular as manifest by Fiona Murray and Siobhan O’Mahony in their 2007 article. I’m convinced that open innovation would not exist without a particular personality trait (quirk) of its inventor, Henry Chesbrough. I feel comfortable in speaking this way, since Henry reminded me the last time I saw him that we have been friends for a long time: we met at the 1996 Strategic Management Society conference in Phoenix as middle aged IT veterans en route to careers as b-school profs, although we got to know each other best during the period from 2004-2006 when we were working on the 2006 Oxford book with Wim Vanhaverbeke. Based on indirect evidence, I suspect that Henry must have been exposed to too much Kuhn somewhere during his graduate school career. (The Structure of Scientific Revolutions was not published until 1962, so he couldn’t have been exposed in the womb). The Kuhnian model of anomalies leading to new science permeates his work, particularly in open innovation. The original 2003 Open Innovation book was inspired by his studies of the puzzle of why Xerox PARC didn’t make more money from its many pathbreaking innovations. Unlike the guys who wrote Fumbling the Future, Henry concluded that Xerox learned from its mistakes and eventually developed a portfolio of strategies for monetizing inventions that didn’t its core business model. 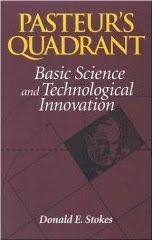 More recently, he has been inspired by Donald Stokes and his book Pasteur’s Quadrant, a more recent re-interpretation of Kuhn’s model of scientific advance. Stokes’ point is that the most interesting research both contributes to scientific progress and has practical real-world utility. The field of innovation studies arguably operates in Pasteur’s Quadrant (Stokes 1997), in that the processes and practices of industry actors often extend beyond the bounds predicted by academic theory. Close observation of the experiments that some of these ﬁrms have enacted reveals that the inwardly focused, vertically integrated model of industrial innovation so celebrated by Chandler (1990) and others has given way to a new, and not yet well-understood model (Langlois 2003a). And so the second chapter of the 2006 book (which he also wrote) he called the chapter “New Puzzles and New Findings.” In the spirit of Kuhn and Stokes, both chapters identified anomalies in the practice of innovation that merited further investigation. In this same vein, the final chapter (written joint by all three editors) sought to identify other opportunities for future research. In September, I was fortunate to be asked to present my own open innovation research at Henry’s Center for Open Innovation; the session gave a background on OI (and UI and CI) to the graduate students. The slides and a YouTube video of this (and other) talks are linked from the COI’s speaker series web page. The discussion afterwards raised some interesting points, including some that might qualify as new puzzles also worth investigating. One of the graduate students asked about how open innovation would happen in Korea — presumably a reference the dominance of the chaebol and the difficulty small businesses have getting a foothold. Another student asked about open innovation in India and China: certainly Chesbrough’s 2003 book (and Chapter 6 of the 2006 book, which draws heavily on it) would argue that licensing internal innovations depends on appropriate IP enforceability (consistent with Teece 1986), and the general belief is that such mechanisms are not as strong as in more developed countries. I could imagine other factors about economic development, government policy or industry structure that would make open innovation more or less likely, but such causal relationships are empirical questions left to be studied. So here are a few more puzzles I think worth investigating. In the spirit of Kuhn, Stokes and Chesbrough, perhaps they will inspire new research that increases our understanding of open innovation. Here’s some quick citation counts of O/U/CI research as reported by Google Scholar. (For a discussion of some of these works, see my Nov. 2008 recommended O/U/CI bibliography).